Many years later, when I was the mother with three young boys and expecting a fourth, I read a book about Marian apparitions and realized that the Blessed Mother has asked us to pray the rosary daily. I wanted to do it, but I did not know how. I knew that the Our Father’s were prayed on the big beads and Hail Mary’s on the little ones, but I was totally ignorant of the opening and closing prayers and mysteries. 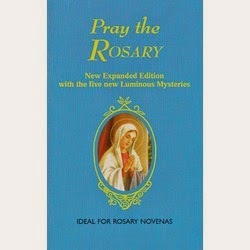 Regardless, I went ahead using just the two prayers until I soon obtained a little booklet on how to pray the rosary. Then, every day, I prayed it. I put the book back on the shelf and found the energy to pray a rosary before going to sleep. The next day, I told Mark and the older boys, ages seven and five, what had happened. “That was quite a coincidence, wasn’t it?” I said. 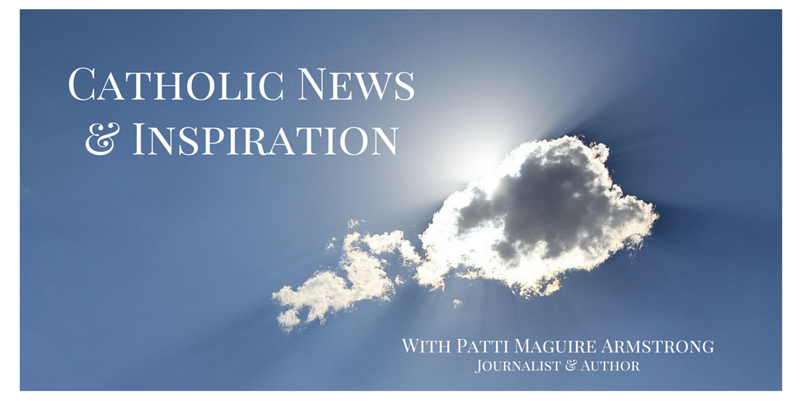 A few days later, it was the same scenario: I had not prayed my rosary yet and it was late. Jacob took an especially long time to get to sleep, and I was unbearably tired. 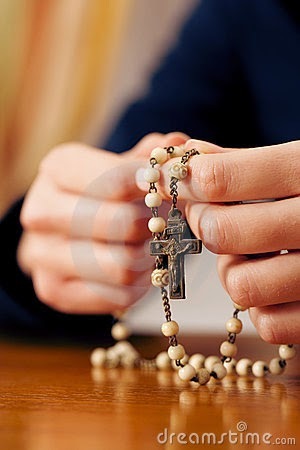 I got into bed and thought: “There is no possible way I can stay up to say a rosary.” At that very moment, I saw with my own eyes, the same book tumble out from the bookshelf onto the bed. It again landed with the Blessed Mother’s picture face up. I held my breath in awe. I was not even moving when the book fell. It was no coincidence that both times, at the exact moment I decided not to pray the rosary, the book that inspired me to pray it had fallen off the shelf with the Blessed Mother’s picture face up. God knew my thoughts. And he knew how to get my attention. Before beginning my rosary, knowing that I would tell Mark and the boys the story the next day, I did a little experiment. I took the book and placed it hanging off the shelf. Then, I moved the headboard back and forth. The shelf slid back and forth on the headboard, but the book stayed in place and did not fall out. Remember, I had been lying still both times when the book had fallen. “Why do you think that happened,” five-year-old Luke asked me the next morning. 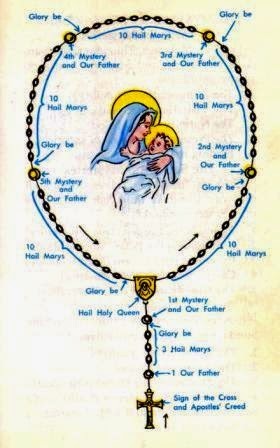 So many Catholics do not understand the power of the rosary. It is a meditation on Christ’s life, with the Apostle’s Creed, Our Father's, Hail Mary's, Glory Be's, and Hail Holy Queen to close. “Why do you pray to Mary?” is a common attack against the rosary. We ask for her intercession. When she interceded at the Wedding at Cana, Jesus performed his first miracle. Shouldn't we follow the Bible? Jesus went through Mary to come to us and we go through her to go to her son, our intercessor to God the Father. “But why so many Hail Mary’s if you are praying to God?” is another common question. The Hail Mary is a Jesus-centered prayer. “Hail Mary, full of grace, the Lord is with you.” The Lord is Jesus. “Blessed are you among women and blessed is the fruit of thy womb, Jesus.” There is Jesus again and Scripture says all generations will call Mary blessed. “Holy Mary, mother of God,” Jesus is God. “Pray for us sinners, now and at the hour of our death, amen.” Asking the mother of Jesus to pray for us is a good and holy thing—something well worth staying up to do. For more inspiration, check out Big Hearted: Inspiring Stories From Everyday Families uplifting stories on love and life. Children's books, Dear God, I Don't Get It and Dear God, You Can't Be Serious are fiction that present faith through fun and adventuresome stories. 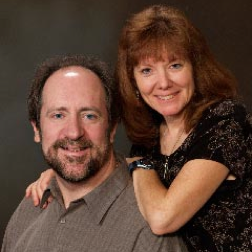 Follow Patti at Twitter and like her Facebook pages at Dear God Books, Big Hearted Families.